“We can’t change what we refuse to confront.” That is a powerful truth – universally and for me personally. Over the years my fears and trials have truly paralyzed me and I have suffered in and struggled with inaction. Joy, productivity, and life-robbing inaction. And it has been my experience that inaction does indeed breed further inaction. Even if that isn’t our intent. Even when we hope and pray otherwise. And especially when we are functionally paralyzed or emotionally debilitated by life’s challenges, trials, and storms. The anecdote, albeit seemingly impossible to believe as possible or implement when we are in the throes of our storms, is action. And for me, action has both required and yielded courage – which has not come easy to me. In fact, I have known many seasons of inaction and fear where I could not summon or feel any courage whatsoever. And without courage or action, irrespective of which comes first, we remain weakened by and stuck in the inaction. In the fear. In the pain. In the doubt. In the trial. In the suffering. So taking action – however difficult, however small, however scary – is what we have to do. Whether that action is being brave or deciding upon the action that we will take or praying for courage and inspiration. We must take the first, next step. Then take the next, first step. Get out of our heads. Get out of our fears. Get out of the house. Get out of the building. Get out and get on living. Recovering. Healing. Transforming. Creating. Thriving. Not easy. Not easy at all. But absolutely necessary if we are to change what is difficult for us to confront. And as we confront our fears, our demons, our impossible challenges, we create change. We experience courage. We conquer fear. We serve as examples of hope and bravery. And we go about living. Joyfully. Productively. Nobly. Happily. Even bravely. Sara Bareilles hit it out-of-the-park with her inspiring song and video about speaking and acting bravely, “Brave.” Both the song and the video move me to feel brave – or at least feel like feeling brave! I have played the video in my classes and workshops and have, as a result, seen others get in touch with their brave. I invite you to watch and listen to “Brave” now and allow the message to help activate or nurture your brave. Well, how big is your brave now? I still have a long, long way to go. I wrestle with my fears and battle my fear disorder nearly everyday. Some days are better than others. And there are still some fears that I am so afraid of that I haven’t confronted them. And maybe I never will. 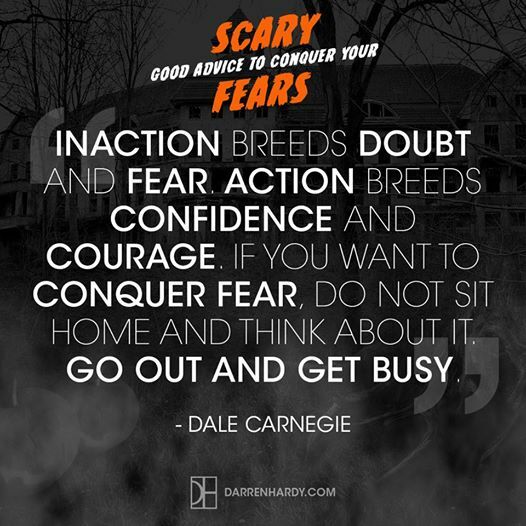 But I am bravely battling inaction and taking action – one action at a time. Even if those actions consist of just doubting my doubts. Calling upon God in humble prayer. Or taking one step forward and two steps back. And, in some areas of my life, I am both happy and grateful to report, I am fear free. But my purpose in sharing here is not solely to focus on my journey – my journey with and through fear and one of its most-damaging consequences, inaction – but to raise awareness and get you to consider your own journey. And more than consider it, but to encourage and inspire you to take action. To confront your fears, to experience courage, and to create change. To find your brave and act on it. To dare greatly. To follow your dreams. To feel better. To live your life. To be yourself. So, what’s your next, first step? What have you been waiting to do? What has fear and doubt kept you from doing that you know that someday you must do? Must confront? Must change? Get to change? How BIG is your brave? Is today the day you take action? That you make that next, first, difficult step? Muster that courage. Find your brave. Exercise faith. Take a chance. Even, fall or fail forward. But take some action. 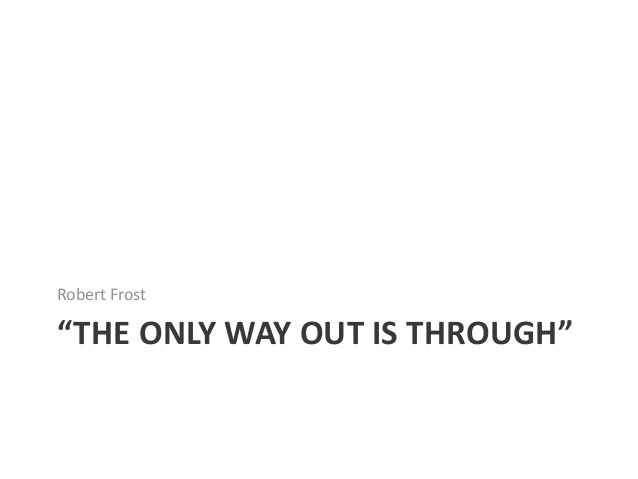 Because, the only way out is through. See you on the other side … of fear.